A couple weeks ago I had the pleasure of meeting Max Keiser and Stacy Herbert, downtown Chicago. On the lakefront, in a very informal chat, we discussed the sorry state of affairs regarding Chicago finances and education. Max released the video yesterday. There is nothing new in the video for Mish readers, but I had a fun time doing a couple segments with Max. Link if Video does not play: Mish with Max. The video is about 25 minutes long, and I come in half way. By the way, my favorite pizza restaurant in the world, discussed in the above video but not named, is Chicago Pizza and Oven Grinder located at 2121 N. Clark. It's not thick, thin, stuffed, double decker, or triple decker. Instead it looks like this. The pizza comes in an extremely hot ceramic bowl (upper left image but bowl not visible). 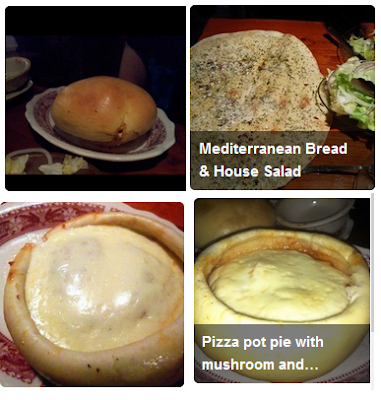 A server with thick padded gloves flips the bowl over and the pizza looks as shown in the bottom two images. The second image is their Mediterranean bread, the best flatbread I have ever had. The flatbread is ginormous. The above image does not do justice to the size. I often make bets with people that CPOG has the most unique pizza in the world. Since tastes vary, I cannot claim best, although it is best for me. I made such a bet with economist Steve Keen and he paid up. Max said I lost the bet on the basis it was not pizza we were served, but spaghetti (even though there are no noodles in the pie) just tomato sauce, meat and huge whole button mushroom (I leave the mushrooms out). Vegetarian is available.